Twitter’s stock has dropped by more than 18 percent percent in morning trading following the company’s report of a consistent quarter-over-quarter decline in monthly active users. 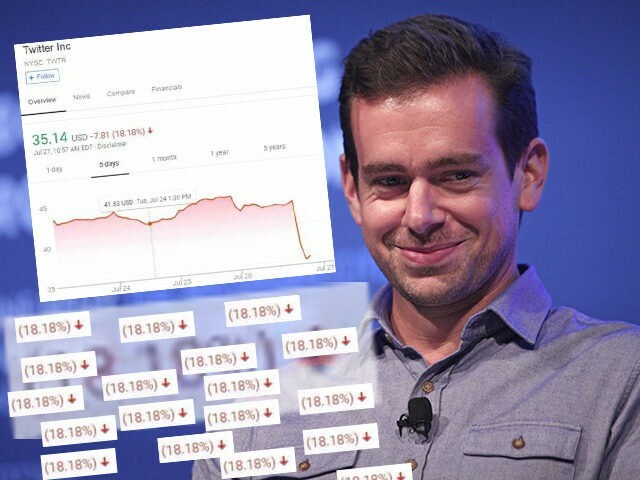 Following the release of Twitter’s Q2 financial report, the company’s stock dropped by more than 18 percent in morning trading. One of the main reasons for this appears to be the platform’s consistent decline in their “monthly active users” number. Business Insider reports that Twitter beat revenue estimates but many other reported figures met analyst predictions. Twitter has faced a tough few days following an article in VICE magazine which appeared to confirm years of Breitbart News reporting about the act of shadowbanning conservatives in which Twitter limits a users followers from seeing their tweets. Following coverage of the issue, President Trump tweeted that he would be “looking into” the discriminatory practices by Twitter against Republicans.